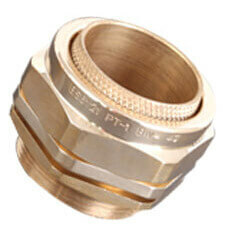 We are engaged in offering BW Cable Gland (3 PART) which is in line with BS 6346 (1969) standards. Material : Brass (Aluminium also avialble on request). Design Features : 2 part armour lock, Knurled armor lack produces a low resistance earth clip. Kit packing is inclusive of Gland with Galv.steel locknuts, Earth Tag & PVC Shroud in one Polythin Bag.